For people like me who’s been in a long-term relationship in over a decade, reading romance novels about single girls getting over a major heartbreak could be a bore. It’s not that we’ve never been there, it’s just that we haven’t felt that brand of sadness in a long time. Amidst all the #hugot lines we see on social media, it’s going to be pretty hard to find a decent read that will remind us of heartbreaks long forgotten. Ana Tejano’s new book, Keep The Faith, is a good exception, though. 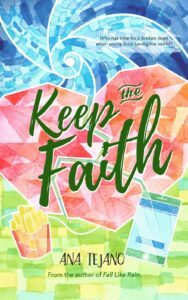 Keep the Faith is about a newly-single development worker (named Faith, no less) who gets back into the daily grind after being away from a mission. Before she left, her boyfriend of five years broke up with her, and she’s forced to nurse her broken heart alone in Iloilo while doing disaster relief operations. Unlike your typical romcom heroines, Faith, seems to have it all together. She didn’t cut her hair, didn’t go into a vengeance rampage and didn’t eat ice cream while wailing for lost love. Instead, she comes back to Manila with a stronger need to help, and meets (or low-key stalks) the new guy in the office named Nico. She’s moving on gracefully—or so she thinks. This novel is a classy representation of the lows and eventual highs of heartbreak, all while giving readers a sneak peak in the lives of development workers whose careers are fueled by our country’s bayanihan culture. First of all, I did not expect to (Spoiler alert! Highlight succeeding text to read.) shed tears on a heartbreak novel like this one, but towards the end of the book I literally found myself heartbroken for Faith. I didn’t even notice the tears running down my face if not for my wet pillows. It’s not just because of the familiar plot lines (we all have that one great love, and that one good friend who never listens to wise love advice). It’s because the characters were so well written, it’s hard not to feel for them. Faith’s personality, for example, was written in such a way that you get to grow with her in every chapter. Her realizations and decisions make you think about what it really means to love somebody, and her nuances were magnified by background stories that Ana Tejano was able to weave successfully into the narrative. James is a character familiar to all of us. I can’t help but imagine James Reid playing this guy in a not-so-far-off movie adaptation. Although he wasn’t present in most scenes throughout the book, he plays a key role in Faith’s character development. (Spoiler alert! Highlight succeeding text to read.) I hated the guy, just like I hated my ex, but by the end of the book I felt really bad for him. They don’t end up as friends, at least not for now. James did try to stay friends with Faith but in the end they both decide to stay away from each other while they’re both healing. If you’ve been reading a lot of YA and mystery books lately, you should move this book down your To-Read List and take on a palate cleanser instead. The phasing and event build up will remind you of the long periods of drought in this country. The ending will leave you with a torrential downpour of feelings, though. Last, I think (Spoiler alert! Highlight succeeding text to read.) the leading man role needs a bit more depth. Nico is described as a rugged-looking office cutie with a soft spot for kids and people in need. While his physical descriptions seem realistic (no abs for this guy because we all know french fries is too good not to eat), his personality is a little bit too good to be true. He’s like clear skies on a rainy season, or ambon in the middle of summer. I would have loved it if the book dedicated a few chapters to explain his nuances, and I sure as heck wouldn’t mind a sequel in his POV. Hopefully, the next book—if there’s any sequel coming up—would paint a bigger picture of the development worker’s world. The book gave me glimpses of their job descriptions, but I’m looking forward to read more about how they see the world, good and otherwise. Non-profit organizations need more spotlight and I appreciate the book’s attempt at portraying the passion that comes with such an unusual job. I like the plot! I’m checking this out for sure. My dad always says to me, when you’re sad, focus on helping other people. I always forget. Thank you for reading our review, Rae! That’s good advice from your old man. Nice to be reminded!